of Willis and other Rebels. Greene's Take: Following a tumultuous offseason, Willis is itching to be back on the floor after serving a brief suspension to start his senior season. He provides stability to the offense when on the floor and also has a reputation for being the Rebels' go-to guy in the clutch. This season, he may flourish even more now that more offensive support appears to be entrenched around him. Willis is also a dogged defender, and is one of the few players in the Mountain West who has a track record for successfully slowing BYU star Jimmer Fredette. UNLV Career: Willis enters his fourth season in the Runnin' Rebel program in 2010-11 ... Has played in 65 games in his UNLV career, making 51 starts ... Has averaged 14.4 points, 4.1 rebounds and 3.4 assists per game for his UNLV career ... Has shot 43.6 percent from the field, 30.7 percent from 3-point range and 80.1 percent from the free-throw line in a UNLV uniform ... As an active player enters the 2010-11 season No. 10 on the all-time UNLV career free-throw percentage chart ... Finished the 2009-10 season by making 29 consecutive free throws, which is an all-time program record ... Has scored in double figures 48 times in his UNLV career and has one double-double ... Sat out the 2007-08 season after transferring to UNLV from Memphis ... Named to the 2009-10 and 2010-11 Preseason All-Mountain West Conference team. Junior (2009-10): Led UNLV and was second in the MWC in scoring with a 17.2 points per game average ... In conference-only games, he led the league in scoring with 20.3 ppg ... Named first team All-MWC and was a member of the league's all-defensive team ... Also named All-MWC Tournament ... A first team All-MWC pick by Sporting News and was USBWA All-District VIII and NABC first team All-District 17 ... Played in 33 games, making 28 starts ... Averaged 3.9 rebounds (third on the team), 3.5 assists (second on the team) and 1.2 steals per game ... Shot 47.8 percent from the field, 29.5 percent from 3-point range and 85.8 percent from the free-throw line ... His seasonal free-throw percentage tied for sixth best in UNLV history ... His 163 made free throws ranks eighth on the all-time UNLV chart for free throws made in a season ... Was seventh in the MWC in apg, third in free-throw percentage, sixth in field-goal percentage, 10th in steals and ninth in assist-to-turnover ratio ... Scored in double figures in 29 games, including scoring 20 or more points in a game 11 times and 30 or more three times ... Had a six-game stretch in January where he scored 20 or more in each game ... Led the Runnin' Rebels in scoring in 21 games ... Was named MWC Player of the Week on Jan. 25, then again he shared the honor on Feb. 8 ... Scored a career-high 33 points against BYU, while also handing out eight assists and not committing a turnover in 38 minutes on the floor ... Was named ESPN.com's National Player of the Week after that performance ... Recorded his first career double-double with 13 points and 10 assists against New Mexico ... Made each of his last 29 free throw attempts of the season, which is now the UNLV record for consecutive free throws made ... Voted team MVP by his teammates. Sophomore (2008-09): Played in all 32 games and made 23 starts ... Averaged 11.4 points per game, which was second on the team and 19th in the MWC ... Second on the team and 10th in the league in assists, handing out 3.3 per game ... Also third on the team and 10th in the conference with 1.1 steals per game ... Shot 37.9 percent from the field, 32.4 percent from 3-point range and 73.7 percent from the free-throw line ... Named the MWC Co-Player of the Week on Jan. 26 ... Reached double figures in scoring 18 times, including a pair of 20-plus point efforts, and led the team in scoring six times ... Scored 17 points, grabbed six rebounds and had four assists in a road win at UTEP ... Came off the bench and scored 19 points against Arizona ... Poured in a then-career-high 22 points and added six assists in a home win over Utah, which cemented his co-player of the week award ... Handed out a career-high 11 assists at Air Force ... Scored 21 points and had six assists against Colorado State ... Went 8-for-9 from the free-throw line and finished with 18 points at Wyoming. 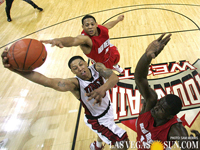 Sophomore - Redshirt (2007-08): Used the 2007-08 season as a redshirt year after transferring to UNLV from Memphis. Freshman - Memphis (2006-07): Played as a true freshman in 2006-07 at Memphis ... Appeared in 17 games and averaged 2.6 ppg and 1.0 rpg in 6.1 minutes per contest ... Shot 39.4 percent from the field, 36.8 percent from 3-point range and 70.6 percent from the free-throw line ... Memphis recorded a 33-4 overall record and advanced to the Elite Eight in the NCAA Tournament ... Scored 12 points vs. Tulane. High School: A 2006 graduate of Washington Union High School in Fresno, Calif. ... Averaged 23.4 points, 5.9 rebounds and 7.0 assists in his senior season ... Finished his prep career with 2,842 points, setting the CIF Central Section scoring record ... Broke the previous mark set by current NBA player DeShawn Stevenson ... The 2,842 points were the fifth-most in California state high school history ... Named to the Fresno Bee 2006 Boys All-Star squad ... Selected the 2006 North Sequoia League Player of the Year ... Helped lead the Panthers to a 28-7 overall record and a 14-0 league mark ... Shot 58 percent from the field as a senior ... Helped lead Washington Union to the 2006 league and valley championships ... Netted 43 points in his final prep game against Harvard-Westlake in the 2006 CIF Central Section Division III quarterfinals ... Prior to his senior season, he was ranked the No. 67 player in the nation (No. 50 senior) by HoopScoopOnline.com ... Rated No. 12 player in California and No. 37 shooting guard in the nation by Rivals.com ... Named to the California All-State squad by HoopScoopOnline.com following his junior season ... Coached by Tony Petersen ... Team was valley champs all four years (2003-06). Personal: Tre'Von Marquise Willis was born Jan. 11, 1988, in Fresno, Calif. ... Majoring in interdisciplinary studies with areas of study in physical education and sociology ... Has a daughter, Tremiyah Willis, who was born in September ... The son of Andrea McDonald and Jonathan Willis ... Has two brothers, Dwight O'Neil (24), who played at Fresno State, and Anthony Trammell (17), and one sister: Aarion McDonald (12).